The TCP development vehicle is a full steel-bodied, 1965 Mustang fastback, built to demonstrate the performance potential of Total Control’s complete line of bolt-on suspension, steering, and chassis products. The vehicle is driven and maintained by Kevin Sittner of Precision Machine and Maintenance in Lodi, CA. 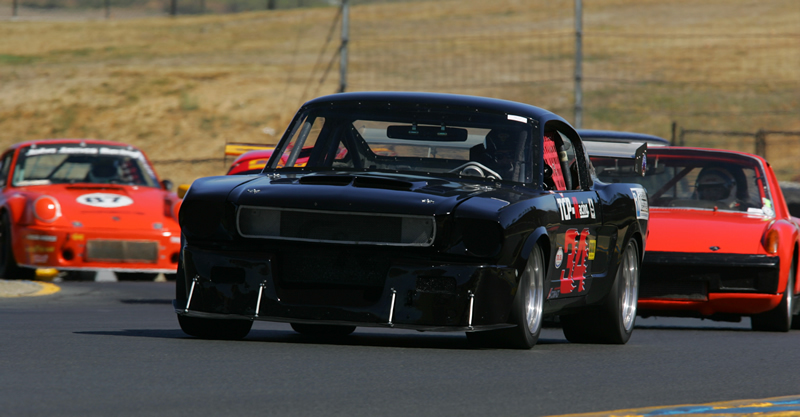 Kevin and his crew consistently position the TCP test car at the front of the pack at many vintage-racing and club track events around the nation. A collection of top times and podium finishes, with SCCA, NASA, HSR, SAAC, SAAC NC, and other driving organizations, have made the #34 a very recognized and reputable performance vehicle. "...it's nice to know that we're not going to run into any snags during installation..."
I've been a TCP distributor, installer, and tuner for over ten years and have had the opportunity to see the product line grow and improve over the years into what it is today. It's always been good stuff, but now it's really some of the best fitting and highest quality products you can find. And when the goal is to finish a build and get the car setup to work for a customer that wants to get it on the track... and fast, it's nice to know that we're not going to run into any snags during installation and that we can get the suspension dialed in fairly quick.